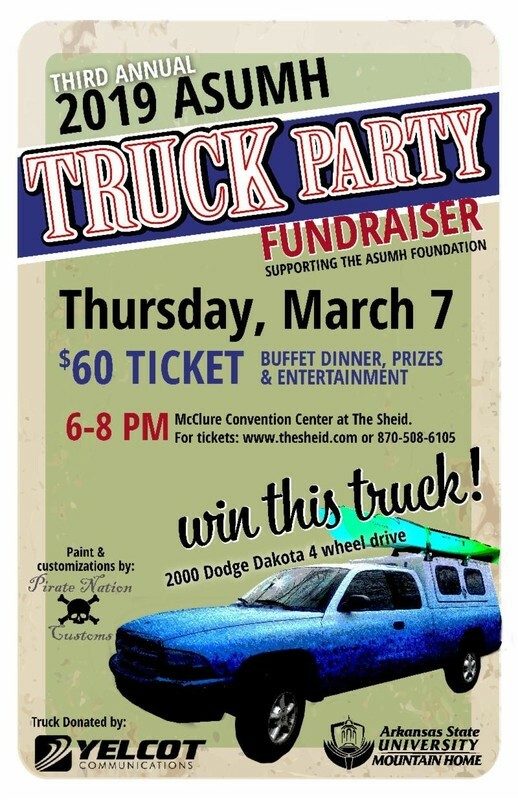 for the 3rd Annual "TRUCK Party"
Thursday evening, March 7, 6-8 p.m.
$60 PER PERSON, includes dinner and a lucky number! All seating is open seating. Reserved tables of 8 are $600. evening is a classic 2000 Dodge Dakota 4-wheel-drive pickup truck donated by Yelcot Communications and customized by Pirate Nation Customs. Checks should be made payable to ASUMH Foundation. balls are returned back into the machine, and the grand-prize-winning ping pong ball will be drawn. Don't understand? Don't worry; we'll explain it all before we start. along with two lucky numbers. are used to benefit Arkansas State University-Mountain Home, and are tax deductible. Thank you for considering a gift to the ASUMH Foundation. at ASUMH by calling 870-508-6109.